My recent acquisition of another schoolhouse clock stimulated my curiosity and prompted me to do some research on the origin of the name. In this article I will describe my thoughts on how the schoolhouse clock came to be and my most recent Sessions wall clock purchase. During my research I found it very interesting that little can be found regarding the history of the schoolhouse clock. I realize that many older readers growing up in the rural areas of Canada and elsewhere in North American have fond memories of the one-room schoolhouse with a large clock in either the front or the back of a classroom. I did not live that experience rather, when I was young and attending a large urban school the Simplex master / slave clock is the one I remember best. The schoolhouse clock that I bought recently adds to my modest collection of three schoolhouse clocks. Given that I spent many years as an educator, it seems only fitting that I would have an interest in schoolhouse clocks. My schoolhouse clocks are all a similar style; short drop octagon, constructed of oak, brass dial bezel, bottom glazed access sash, 12 inch dial or 9 inches as in this case of this clock and the Waterbury pictured below. Although 9 inch clocks were used in schoolhouses they were also found in office or workplace settings. Schoolhouse clocks were the standard design for early North American school houses because of their larger, easy to read dials. These distinctive clocks were hung in many schools rooms across Canada. The majority had simple but tough time-only movements and some even came with a calendar function. Occasionally they were ordered with time and strike movements but the cheapest and most popular versions were time-only. This type of clock had a very utilitarian look and function. They were not always called schoolhouse clocks. None of the labels on my clocks have the word “schoolhouse” written on them and are either described as a”drop Octagon” in the case of this Sessions or have a specific model name. The term schoolhouse clock was not applied to them when they were made but came to be known as a particular style of clock found in school settings by later collectors. If a particular style was ordered by a school authority makers might have informally described them as clocks for schools or “school clocks”. In any event, the term has become a permanent part of the clock collector language. With a swinging pendulum visible from a distance the clock can easily be seen running and the open-door bottom access sash allowed for restarting and adjusting the rate. In some clock collecting circles it is said that schoolhouse clocks are a derivative of the English drop dial fusee clock, an example of which can be seen here. 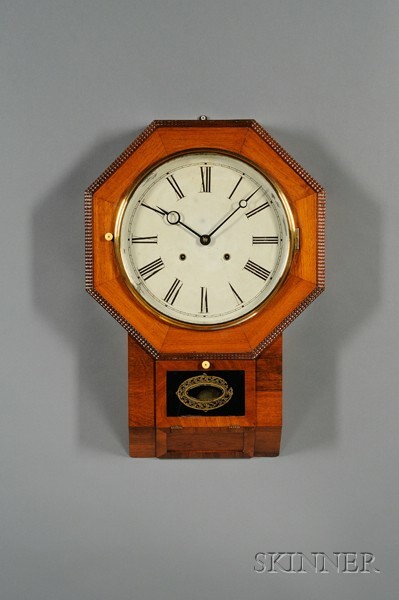 Drop dials were produced in the late 18th through to the 19th century and closely resembled the schoolhouse clock. Unlike spring-driven schoolhouse clocks, fusee clocks have conical construction from which a chain or gut-line is pulled by the mainspring barrel allowing the power of the mainspring to be released evenly thus assuring better accuracy. When I am in the process of buying a clock I always ask the question. “How much do you know about this clock?”. I always ask this question because I am interested in a clock’s provenance and some of the stories are quite intriguing. The seller, a man in his late fifties, thought about it for a moment and said, “Well, I’ve had it since I was 14”. The clock came out of a decommissioned one-room schoolhouse in a small town called Springhill, Nova Scotia (Canada). However, when I first saw the clock I said to him, “It looks like a nice office clock”. The seller quickly corrected me and said, “It’s a schoolhouse clock”. “It runs for a little bit and then stops, maybe you can do something with it”, he added. It is a 1920’s vintage Sessions Drop Octagon wall clock. It has a solid medium dark oak case with original hands, ornate pressed brass pendulum bob, solid brass bezel, 80% of an intact label on backboard, tin dial pan and stenciled lower glazing on the sash. The paper dial is original but it is heavily “foxed”. The movement is 8-day time only. The dimensions of the clock are a 9″ diameter dial, 19″ high, 13 1/2″ wide by 4″ deep. It is in reasonably good condition given it’s age and for $20 it was quite a bargain. It is also intact; there are no missing or broken pieces. I don’t think this clock has been run in quite some time. I took it home, hung it on the wall and true to what the seller said it would run less than a minute and stop. I noticed a rubbing sound around the pendulum area as it was running. The pendulum bob was hitting against the inside front of the case. I took the movement out and observed a bent crutch rod, corrected it, put it on a test stand and it ran immediately. As expected the movement had quite a bit of grime and required attention but it ran for a day before I took it apart for a thorough servicing. I don’t think this clock has been run in quite some time. I found it curious that the suspension spring was soldered where the spring hooks into the top block. It likely kept slipping off and solder was used to keep it in place. In any event, the spring cannot be taken out without first removing the solder! The clock is in very good overall condition for it’s age and the movement was not as dirty as I first thought. The pivots are in decent condition for the most part and there is minimal wear overall. The movement was disassembled, cleaned and in the process I decided to install two bushings for added insurance, one on the escape wheel (front plate) and the other on an intermediate wheel (front plate). The movement was tested, put in beat and reinstalled back into it’s case. I may replace the paper dial but I am going to see if I can live with it for the time being. The dial has many brownish spots as you can see in the next photo. The clock had to have been in a moist environment for a long period for the paper to discolour. My two options are, one, leave as is or, two, replace with a paper dial. I may replace the paper dial but I am going to see if I can live with it for the time being. The brass bezel cleaned up well but the exposed tin surrounding the paper dial has blackish areas which I managed to reduce with CLR but could not totally eliminate. Of course, I later learned that CLR is really not appropriate for this purpose as it is an acid. The case has years of grime which was easily remedied with Murphy’s soap and water. It cleaned up very nicely. Following the cleaning I gave the case a light coat of shellac to restore the luster of the oak. It looks good and it runs well. My other drop octagon clocks are a Waterbury Arion, an unknown Ansonia and an Arthur Pequegnat Brandon II. Time-only movements are the easiest to work on and a very good movement to learn on. Time-only movements are the easiest to work on and a very good movement to learn on. If you are a beginner in clock collecting and repair clocks such as this are satisfying clocks to work on and presents few challenges. I am happy that I managed to bring this particular clock back to it’s former schoolhouse glory. The term schoolhouse clock is a term that was not applied when they were made but came to be known as a particular style of clock found in school settings by later collectors. The schoolhouse clock is such an endearing name that when one thinks of a schoolhouse clock the memory of these specific styles of clock immediately comes to mind. I like the current dial. The wear on it matches the finish quite well. I always find it a bit unusual to see a gingerbread style pendulum in these. I’m more accustomed to seeing the style with 2 leaves at the top, however. Would you believe that out of about 150 clocks in my collection, I don’t have a single schoolhouse clock? I also don’t have a store regulator (I came close to buying a wreck of one, but passed on it as the pressed top or base was missing). I also don’t have any calendar clocks (except for a loose gingerbread clock movement). I guess they don’t have that much visual appeal for me. Actually, now that I think about it, I do have one that could maybe qualify, and it’s an inlaid “Anglo American” clock with a European case. Rosewood veneer and pewter inlay. Octagon top, with a short base and a rounded bottom. I had also mistakenly bought a cheap celluloid Asian schoolhouse clock which was broken in several places, but I ended up scavenging the parts from it and scrapping most of the case (too much missing, and the broken/chipped plastic finish over the wood was impossible to repair or duplicate for new parts). The more I look at the clock the more I am okay with it. 150 clocks? Time to profile them, JC! 150 is really only a vague estimate. I’ve completely lost count after 100, and in the past year I’ve been donated at least 4, and bought 2 or 3. Most of the ones that have been restored are on my collection page, but that site hasn’t been updated in years. Just the other day, one of my clients actually donated a rather nice (and big) Vienna clock made in the 1980s in oak. Apparently one of the springs broke on it and he just didn’t want it anymore. It has a Westminster Hermle type movement. Not really what I collect. I have no idea how much work it needs. Last time it was here was to re-attach the pendulum leader (broken suspension spring) and I noticed that the hammer tails were so thin that from wear, one no longer worked properly. No easy fix for it either. The pins and lift-tails were both basically as thin as a cereal box, so they just barely engage each other. I suppose I could replace all the pins with wide ones… Sounds like a lot of trouble though. Collection (4o clocks are shown, some include audio clips and extra info). There are a bunch more in the “Coming Soon” section as well.